2,3" size blue disc of Neptune. A rare stretch of relatively good seeing produced some images with faint features in them. This last image of the night shows banding and brighter polar region even better. 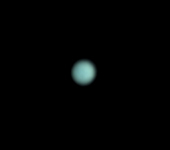 Neptune captured from very low altitude, the bluish color is clearly visible. This and the next image show again some albedo differencies on the disc. The same dark and light areas as in previous picture can be seen here also. Beautiful pale disc of the ice giant. The seeing was steady but transparency was poor, so nothing much more than the shape and color can be seen. A True-color image of Uranus. Polar region towards the Earth is on the right. Seeing was steady and transparency was also goodish allowing some banding to show. The polar region to the right is clearly brighter than the rest of the disc. 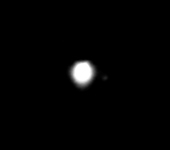 A composite of Uranus and 4 moons, from left to right: Umbriel, Ariel, Titania and Oberon. 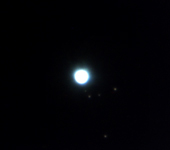 A composite of Uranus and 5 moons. Neptune and its large moon Triton in a composite image. Neptune and Triton in a composite image. Some faint albedo differencies are seen in this image. Only color and shape in this image. The disc of Uranus on a very foggy night. 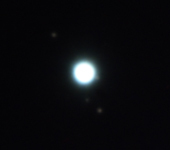 Some faint brightness variations are seen here. The usual faint albedo variances are seen. From left: Titania, Umbriel, Miranda, Ariel, Oberon. A link to the animation of the moons is Here. Some brightness differencies are seen in this and other images of the night. The polar region is clearly less dark. And the last image showing the same faint details. 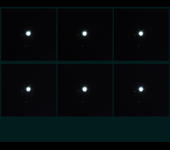 All five "easily" visible moons are on the same side. Oberon is on the bottom, the rest from left to right: Miranda, Ariel, Umbriel, Titania. This and the 2 next images taken at F20 show some faint albedo differencies. Seeing changed within seconds during imaging resulting different levels of sharpness. 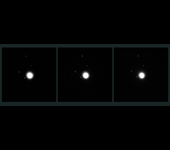 Two more images showing the 5 moons. And the last one with slightly different settings. Miranda is hard to see, but just visible..
Neptune from 16 deg. elevation. The 7th biggest moon of Solar system at 7.30 in this picture. 120 1s exposures. 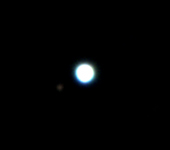 Only 4 moons were visible, from top to bottom: Oberon, Ariel, Umbriel, Titania. Seeing was quite bad, so only shape and color can be seen here. So far the "best" of my Neptunes. The moon has moved to the other side compared to 18.10. 150 1s exposures. The moon is on the same side again as the orbital period of Triton is 5,88 days. 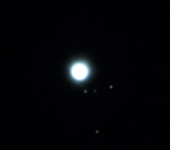 Only 4 moons were visible, from top to bottom: Oberon, Umbriel, Titania, Ariel. Animation is here. Tried to get something out of Uranus but the seeing was not good enough. IR image showing big differencies in brightness. Uranus @f20 same as 0.28 image. Uranus @f25 some banding and zones are seen.